Can Videogames Get Kids to Play Outside? The rise of videogaming has been blamed for encouraging sedentary, inactive lifestyles in children, and consequently stunting critical early-age development. But can games be used to fix this problem, too? We've all heard this before: Games keep kids inside, glued to the TV, instead of running around and playing. While games certainly aren't the only source of blame, it's hard to deny that the one-two combination of popular games and the widespread panic amongst parents of letting kids go out and do anything unsupervised in public hasn't been a positive thing for children. Kids are supposed to go out and explore, to see new things and get their knees skinned while discovering a really cool new rock that they've never encountered before. It's an important part of childhood development, and one that many kids aren't getting these days, a situation that the "free-range kids" movement is trying to do away with. Just as games have historically provided kids with alternative modes of exploration, games might also be able to help in the reclamation of public spaces for play. Games like Bulpadok's The Hidden Park for the iPhone and Aspyr Media's Treasure World for the DS tap into the technological capabilities of mobile game devices to generate a new type of portable playground. Drawing on trends established in alternate reality games, this new crop of outdoor gaming titles incorporate real-world exploration into gameplay through the use of GPS and wireless communication. Buildings, park benches and cul-de-sacs become the secret hiding places of fantastical creatures and treasures. As such, they provide kids with shared tools for re-defining their relationships with urban and suburban landscapes. 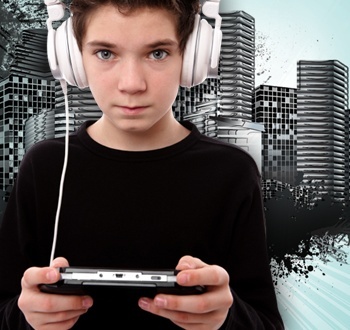 So for parents - or would-be parents - who want to get their offspring out and playing like kids should even in urban environments that aren't designed for children, you might want to consider kicking them off the Xbox 360 ... and giving them a DSi. For the full story, read "The Hidden Playground" by Sara Grimes in Issue 227 of The Escapist.